Should you not come to my funeral, you will surely come to my grave. has been sung now for over 800 years by Sufi’s and qawwals in South Asia. The couplet above is from a famous Persian composition of his, khabaram raseed imshab (click here for the entire ghazal and its translation in English). There are excellent renditions of this ghazal by Nusrat Fateh Ali Khan and the Sabri Brothers. I was not at the funeral in 1325, but as Khusro himself said, ba-janaajah gar na ayee, ba-mazaar kuahi aamad, and I did indeed go to his grave, this time I was in Delhi in July 2007. The picture above was taken standing right outside the inner sanctum where Khusro lies buried. A kneeling pilgrim is visible at the bottom of the picture. 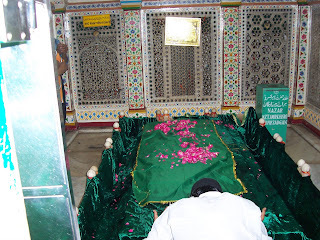 Khusro lies buried right next to his spiritual master Hazrat Nizamuddin, as per his wishes. His mazaar is in the same compound as Nizamuddin’s, just behind where the qawwals usually sit to offer qawwali to the master. The first time I went to Nizamuddin, I did not know where Khusro’s mazaar was, and as I had entered the dargah from the back door (so to speak), I did not encounter Khusro at all. So I returned from the dargah without even getting a darshan of Hazrat Ameer Khusro. Of course I had to go back. Compared to Nizamuddin’s magnificent mausoleum, Khusro’s is much more modest. Nizam get the Khusro-Nizami Bandhu qawwals singing his praises every evening. Khusro only had three ragged looking unknown qawwals regaling him. But away from the shine and glitter, the aura of Nizam, tehy somehow looked more authentic, more dedicated, more pure. I don’t know why, but it just seemed that way. Even now, when I think back to those three musicians, with a harmonium and a tabla, sitting outside Khusro’s grave, singing, my heart fills with a strange emotion, not quite joy, not quite sorrow, not quite a mixture either. Amidst the thronging pilgrims at Nizam’s grave, Khusro seems relatively neglected. It is of course true that Nizam was the master, Khusro only the disciple, and the one who inspires is always greater than the one who is inspired. Every artist realizes this. No doubt Khusro did too. And yet, for me his poetry, his songs become a universe in themselves. Nizam is sometimes forgotten. Is that sacrilegious?